Not to be confused with Slave catcher. Slave raiding is a military raid for the purpose of capturing people and bringing them from the raid area to serve as slaves. Sometimes seen as a normal part of warfare, it is nowadays widely considered a crime. Slave raiding has occurred since antiquity. Some of the earliest surviving written records of slave raiding come from Sumer (in present-day Iraq). The act of slave raiding involves an organized and concerted attack on a settlement with the purpose of taking the areas' people. The collected new slaves are often kept in some form of slave pen or depot. From there, the slave takers will transport them to a distant place by means such as a slave ship or camel caravan. When conquered people are enslaved and remain in their place, it is not raiding. 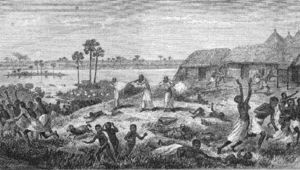 Slave raiding was a violent method of economic development where a resource shortage was addressed with the acquisition by force of the desired resource, in this case human labor. Other than the element of slavery being present, such violent seizure of a resource does not differ from similar raids to gain food or any other desired commodity. Slave raiding was a large and lucrative trade on the coasts of Africa, in ancient Europe, Mesoamerica and in medieval Asia. The Crimean-Nogai raids into East Slavic lands provided some two or three million slaves to the Ottoman Empire over the course of four centuries. The Ottoman corsairs from the 16th century onwards through 1830 engaged in razzias in Africa and the European coastal areas as far away as Iceland, capturing slaves for the Muslim slavery market in North Africa an the Middle East. The Atlantic slave trade was predicated on European countries endorsing and supporting slave raiding between African tribes to supply mass quantities of Africans, who became the workforce of agricultural plantations in the Americas. The many alternative methods of obtaining human beings to work in indentured or other involuntary conditions, as well as technological and cultural changes, have made slave raiding rarer. This page was last edited on 6 March 2019, at 06:10 (UTC).